Classic examples of the regulated transcription of genes are loop-based genetic switches that determine developmental choices such as quiescence versus virulence in bacteriophages or organ identity in plants. Studying these switches, offers a unique opportunity to discover ubiquitous regulatory principles. Loop-based genetic switches are present in all kingdoms of life. At their basis is the interaction between proteins bound at distant sites. This interaction causes the formation of a DNA loop. The looped and unlooped DNA state correspond to the ON/OFF (or viceversa) position of the switch. Investigating the conformations, thermodynamics and kinetics of different repressor-mediated genetic switches, we were able to point out the elements that are essential to make most loop-based genetic switches robust and yet responsive to environmental cues. Some of these essential elements are: modular binding sites with differential affinity for cooperative and tunable protein interactions, non-specific binding (in addition to specific binding) for synergy and molecular memory, DNA supercoiling for added stability and switching trigger, and a protein loop closure that can withstand high torsional stress to maintain the looped switch state in the face of varying torsion on the DNA outside the loop. 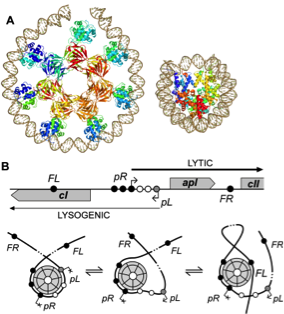 The Figure below shows the molecular interactions that govern the switch from lysogeny to lysis in bacteriophage 186. Figure adapted from H. Wang et al, NAR, 2013. Left: A - The 186 repressor is a heptamer of dimers which can wrap DNA. The nucleosome is shown besides it for scale comparison. B – (top) Schematic representation of the 186 DNA regulatory elements. pL is the lysogenic promoter from which the 186 repressor (CI) is transcribed; pR is the lytic promoter; solid black circles represent specific binding sites for 186 repressor DNA binding domains in the heptamer; empty circles represent non-specific binding sites. (bottom) Three possible 186 nucleoprotein conformations. Right: AFM analysis of the modes of interaction between 186 DNA and the 186 repressor protein. A – histogram showing the 186 Ci protein specific binding at the FL, pR and FR sites. 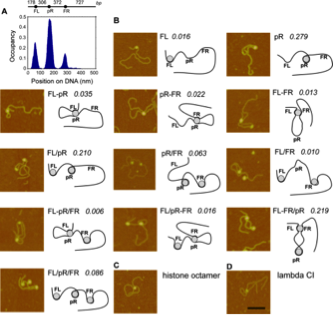 B – AFM images showing the different nucleoprotein complexes detected and their frequency of occurrence. These different conformations play a role in the robustness of the 186 switch. C – histone octamer. D – lambda CI protein mediating a DNA loop.